SUBHEAD: CEO Jeff Bezos will not stop until Amazon is one giant, automated, and fully self-contained system. Image above: Amazon bought the company, Kiva Systems, that make the robot is has deployed in its warehouses. From (http://www.businessinsider.com/amazon-doubled-the-number-of-kiva-robots-2015-10). 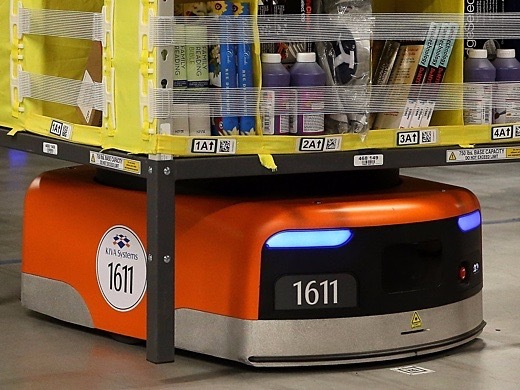 As the Seattle Times reports, Amazon now has some 45,000 robots across 20 fulfillment centers. That’s a bigger headcount than the armed forces of the Netherlands. It’s also a 50% increase from last year’s holiday season, when the company had 30,000 robots working alongside 230,000 humans. For now, the growth rate is keeping pace with that of human additions: from Q4 of 2015 through Q3 of 2016, Amazon reported a 46%, 12-month increase on average in staffers. However, as the pace of carbon-based employment eventually plateaus, that of new robot recruits will only continue to rise. “We’ve changed, again, the automation, the size, the scale many times, and we continue to learn and grow there,” Amazon Chief Financial Officer Brian Olsavsky said of the robots in a conference call last April. However, as minimum wages continue creeping higher, the "economic reasons" to boost robotic volumes will dominate, and most if not all fulfillment centers will become "fully outfitted." Of course, warehouse automation is just a part of Amazon's grand vision of maximizing logistical and supply-chain efficiencies, as well as eventually doing away with bothersome paychecks for employees. Several weeks ago, Amazon announced that it had made its first automated drone delivery in the UK. More recently, the company obtained a patent for an "airborne fulfillment center utilizing unmanned aerial vehicles for item delivery", i.e., a giant flying drone mothership zeppelin warehouse. By now, it is becoming clear that Bezos will not stop until Amazon is one giant, automated, and fully self-contained system, along the lines of the following video showcasing how early-generation Kiva robots have already displaced thousands of human workers. Within a few years, expect all of Amazon's warehouses to look virtually the same. Video above: Kiva robots at Amazon "Fullfillment" Center gathering ordered items for humans that sort for packing - for now. From (https://youtu.be/quWFjS3Ci7A).